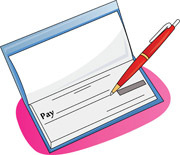 QCPC dues were due on January 1. Dues are $20/person per year. Make your check out to QCPC. You can pay our Membership Chair, Susan Jones. She has a box beside her front door at 2620 E. Arica Way. Susan will also be available at the Jan. 11 Round Robin to take checks. We will purge our membership list at the end of January, so you will no longer be a Club member if you haven't paid dues by then. Lenny Friedman will offer Beginner I lessons on January 13 and 28 from 1 - 3 pm. These are a Friday and a Saturday. Wear court shoes and bring plenty of water. You don't need to have your own paddle or balls. Lenny will give his follow-up Beginner II lesson on February 7 at 1 pm. You must have taken Beginner I and played 6 times to participate in Beginner II. Meet at the Ramada about 10 minutes before the lessons begin. Mark Rennesen's clinics have been changed to Tuesday, 1/17 and Wednesday, 1/18. These are intended for 3.0 and 3.5 players who are keen to improve their pickleball games through fun and focused drills and games! January 18, 8-10 AM - You’ve Hit the Third Shot….Now What?! If you are on the fence, Mark invites you to look at our totally un-edited survey responses to see what others have said. The following article is about pickleball safety. Many people decide not to play pickleball due to their fear of injury. Pickleball is not only fun but is great exercise too. Like any other sport, care must be taken to avoid overexertion and injury. The following are some safety tips from the USAPA which you should do to stay healthy and have more fun. Be sure to have the proper shoes. Comfortable court shoes are a must; sneakers or running shoes do not supply the right kind of support for the side-to-side action inherent in pickleball. Give any existing injury plenty of time and rest to heal before you resume play. Know how to get help quickly if you or a co-player are hurt or develop a medical problem. Is there a telephone, a first-aid kit and an automatic external defibrillator (AED) nearby? Never play on a wet court; they are extremely dangerous. One way to check a damp court surface is to press your toe down firmly and make a twisting motion. If you leave an obvious “wet” spot it’s too wet to play. Check with your doctor regarding exercise and any physical conditions that exist or may have previously existed. Warm-up: The main purpose of a warmup period is to raise the general body temperature prior to playing. The warmup period should be approximately 5 minutes. Try a fast walk to the pickleball courts, riding a bike or treadmill. Stretching: Following the warmup period, begin a stretching program. This will increase your flexibility, which allows for better performance and decreases the possibility of injuries. The muscles/joints that need to be stretched are: ankles, Achilles tendon, calf muscle, quadriceps, hamstrings, groin, lower back, shoulder and arms. Eye Protection: While hollow and lightweight, the ball used in pickleball is a hard polymer and can travel at a very high rate of speed. The use of proper eye protection is highly recommended for all players. During Play: Learn to return lobs correctly. Never back up on your heels. Instead, turn around and go back to get to the ball. During play, if pain occurs stop playing and ice the area of pain. Continuing to play will likely aggravate your problem. Don’t try to make plays beyond your abilities. Be sure to drink water, replenish electrolytes and eat appropriate snacks. After Play: Cool Down. After playing, you may want to do a little stretching or take a slow walk home. This will help lower your body temperature and bring your heart rate slowly back to normal. Treatment: Ice Therapy: There is a misconception that you use heat for strains and ice for sprains. Use ice for immediate treatment of injuries. Ice, compression and elevation should be used first for all injuries. Apply ice for a minimum of 15 minutes or until numb. Heat: Heat should never be applied immediately to an injury (sprains or strains). It should only be applied after 24-72 hours. Professional Care: It is always best to seek the advice of a doctor for any injury, especially for fractures, head injuries, eye injuries, 3rd degree sprains and strains, etc. Call 911 for any serious injury. Special Needs: Never start play without wearing prescribed braces or supports. Know your exercise limits and be sure to tell co-players what they are. If you have a history of heart problems, back pain, tennis elbow, breathing problems, etc. be sure you have any equipment or medicines at hand. Voyager Pickleball (8701 S. Kolb Rd. in Tucson, AZ) will be offering a one-hour Update Class for Experienced Referees on Friday, January 27th at 11:30am in the Santa Rita Room at Voyager. This classroom clinic is open to anyone, from any club, who has refereed in the past. We are trying to get all referees up-to-date on the standardization of best practices for refereeing as delineated in the USAPA’s Referee Handbook. You are welcome to bring your lunch and then practice on-court after the class, during the Voyager’s afternoon Structured Play sessions. This class and the prerequisites are required if you plan to apply for USAPA/IFP Referee Certification. 1) Download and read the USAPA/IFP Referee Handbook from the USAPA website. 2) Download and read the USAPA/IFP Line Judge Guide from the USAPA website. 3) Take the online, open book Rules Test and Line Judge Test on the USAPA website after reviewing the current rulebook. If you are not a current USAPA member please contact Priscilla Scott directly using the information below. RSVP for this update class to Priscilla Scott, pscottpball@gmail.com or 847-738-7443. Separate Round Robins for men and women will continue to be offered every Wednesday morning at 10 AM, except when there is a Club-sponsored social event on a Wednesday. Round Robins are scheduled for January 11, 18, and 25. Plan to play 6 games, finishing at about 12 noon. Check-in by 9:50 at the Ramada; no late check-ins can be accommodated because the charts must be set up. This is a fun way to play with many different people.